Sprinkle 20g of Red Leicester grated cheese onto one of the pieces of bread. Carefully lay the ham on top of the cheese, folding in any loose ends, then spread the sweet pickle onto the ham. 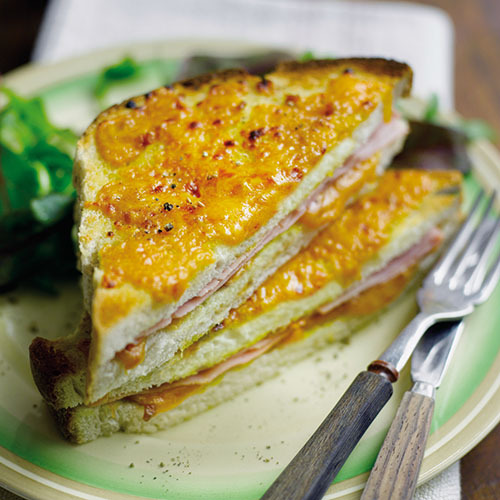 Sprinkle another 20g of Red Leicester grated cheese over the ham, season to taste, then place the second slice of bread on top and press down firmly with your hand. Butter the top of the sandwich with half the softened butter. Transfer the sandwich to the grill pan and grill approximately 8cm (3 inches) from the heat. When golden and crisp, carefully turn the sandwich over; butter the untoasted side and sprinkle over the remaining Red Leicester cheese. Return to the grill and toast for another couple of minutes until golden and the cheese is bubbling. Serve immediately and enjoy with a mixed salad.